"Doug - Now GOP better work smart & pass pro market legislation even if vetoed. 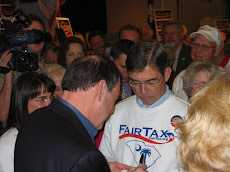 They must make case for the private economy and I hope the FairTax soon. Need great communicators. McConnell is weak in this." – Our Wall Street Finance VP. "I'm just watching the talking heads on all the news outlets. They seem to be like politicians as they can say anything they want & are not held accountable. However a loud & clear message has been sent to BO. Now let's see if this latest batch of gutless politicians are any better that the last ones (I doubt it)." – My brother-in-law. "I was wrong in predicting Republicans would lose the election. I thought BO would make a big push for Hispanics to vote - he did not. I thought he would make immigration an issue - he did not. I thought people would remember Republicans were not doing anything positive in Congress - people forgot that. Do not be surprised in the next election if Democrats win – assuming that Republicans pass bills that cater to the rich & ignore the general population." – The Historian. The above three messages, received from long time subscribers to RTE, are representative of the uneasiness that people in general view the results of Tuesday's midterm elections. After the House Republican freshman class of 2010 capitulated within three months of taking their oath of office in January 2011 we have every reason to be uneasy again. The 2010 midterm did not set a reassuring precedent – see Only 21 Of 87 Freshman House Republicans Are Still With You for details. We start this time with the contradictory Mitch McConnell, the presumed new Senate majority leader, not making us feel better when, during a debate with his feckless opponent the week before the election, he endorsed Kentucky Kynect, the ObamaCare website in Kentucky that has been used by over 400,000 people to sign up for ObamaCare – mostly through the Medicaid expansion feature of the law. Although Mitch assures us that he wants to tear out ObamaCare "root & branch" his endorsement of the website is disconcerting & I am scared to death that it is an indication of more contradictions to come. It is true that the majority of 2014 Senate midterms were held in Republican home-court states, defined as states that BO lost in 2012, which put most Senate Democrats @ a disadvantage. But the real story of the midterms was the record low turnout & the profile of that turnout that has allowed one fifth of the voting eligible population to make such a strong statement against BO. The pre-election polls that called for one squeaker after another missed the low turnout, meaning they thought more Democrats would vote than actually did. See graph below for turnout. 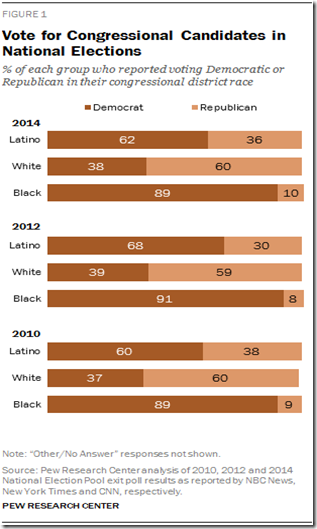 The electorate in 2014 was "far whiter, more male, older, & angrier" than in 2008 & 2012 when BO won the presidency. Seventy five percent of the electorate was white in 2014. This profile of the electorate may never be repeated in a winning combination for Republicans as the share of white voters declines & older voters die. For instance Democrats won the under 45 vote, the female vote, & the Black & Latino vote but Republicans won the 45 & over vote with heavy influence by both those white voters over 65 & male voters. Click here to see the entire breakdown. Turnout is measured in three ways: 1) as the percent of actual voters to those who were registered, 2) the percent of voters to the voting age population (VAP) , & 3) the most accurate measurement - the percent of voters to those eligible to vote – the voting-eligible population (VEP). 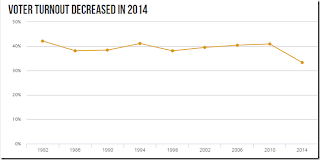 The 2014 midterm VEP was 36.6% versus 40.9% in the 2010 midterm. Only twelve of the fifty states turned out a higher percentage of eligible voters in 2014 than in 2010. In raw numbers this means that 83 million people voted in 2014 & 144 million people eligible to vote did not vote. Now if the turnout in 2016 is the normal 60% presidential turnout then @ least another 53 million people will vote in 2016 – not counting population growth. This means the profile of the electorate in 2016 will be substantially different from the one that voted last week. Republican pundits like Laura Ingraham & Ann Coulter took comfort that statewide candidates in Texas (44% gov & 48% senate) & Georgia (47% gov & 42% senate) scored over 40% with Latino voters - but the overall percentage of Latino support for Republicans is under 40% which is not enough to win a national election & is actually down from the 2010 midterm election so we can't say that Latinos broke for Republicans. 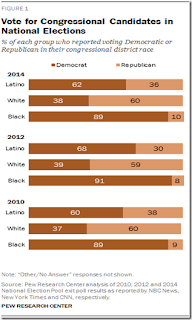 See Pew Research Center graphic below – notice the Latino gap actually increased from 22% in 2010 to 26% in 2014. The small total electorate in 2014 will expand in 2016 – the 2014 electorate consisted of people who were responsible & motivated to vote. The 2016 electorate will include the Latinos, Blacks, Asians, & single women who need a presidential figure to lure them to the polls with the idea of getting something for nothing. "These are entitlement seeking voters strongly lured to vote for what keeps them in the same place - not developing their talents, not seeking new and more promising employment opportunities; rather many just desire a continuation of entitlements, oblivious that continued policies will soon jeopardize these entitlements" writes our Wall Street Finance VP. It took six years before enough people finally realized that their own government was purposely being made the enemy to their way of life under BO's policies – thus the rejection of the Democrat candidates last Tuesday for the most part. People voted against the status quo because the status quo had become so egregious for Republicans & Independents while Democrats stayed home because they saw BO's promises of hope had been hollow all along. People saw through false issues like the Republican "war on women" to the point that one losing Democrat candidate was labeled "Mark Uterus." The insincerity of the Democrat campaigns was best illustrated though by Michelle Obama when she campaigned in Iowa for a person she did not know. Click here to hear MO finally being corrected after giving out a fictitious website that has now grown in mock popularity. 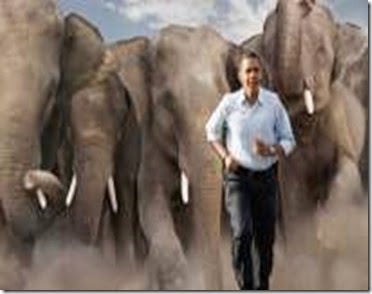 Nevertheless for now BO will be slowed down & Republicans have a chance – but a chance for what? Many pundits have told Republicans to go slow or to present bills that BO has to sign or if he vetoes them he will show how Harry Reid has protected him from governing during his entire presidency. That is fine as far as it goes but it is a complete mindset change from dependency to freedom that is needed & the Republicans have the chance to make it happen. To turn the country around the newly elected Republicans have to show that the problem with America is not economic but political. In this regard they must unleash the free enterprise system so that businesses are no longer seen as the enemy but rather the way to prosperity especially for the much maligned middle class. They have to show that the Federal Reserve, in cahoots with BO, is swindling Americans @ the median income level out of $1,000 per year in purchasing power with their seemingly benign policy of 2% inflation each year. They have to change the mindset expressed by Hillary Clinton when she said that businesses do not create jobs. Republicans have to explain what a job really is under a free enterprise system – namely, an opportunity to create more present or future value for an employer than it costs to maintain the worker in the job. If the employee's value drops below the cost of maintaining the employee the job disappears & that of course includes minimum wage jobs. It must be pointed out that none of BO's policies create one job that results in wealth creation - how do you create sustainable wealth-producing jobs by taxing income? 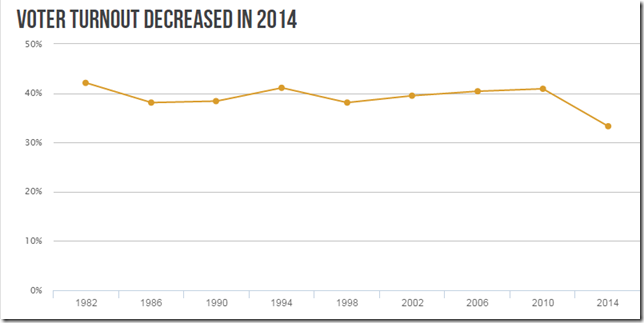 How do small businesses expand when you increase taxes? What economic freedom principles are enhanced when you raise taxes? 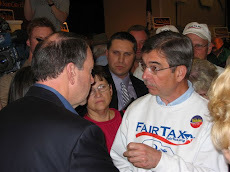 Republicans have the chance to go back to basics & govern like they really believe it – that the general Welfare of the United States is best served by people – men & women, homosexual & straight, Hispanic, Black, & Asian, – working in the cooperation that is the free market capitalistic system – this is the inclusive message that they never clearly deliver. America's brightest future will be realized when all of the really unclever gamesmanships that BO & the Democrats play are not just put aside but are unmasked as the domestic enemy of America that has infected our country with the clear intent of ruining everyone's chance @ the American dream. Republicans have to show government dependent Democrats – "Romney's 47%" of the people who are dependent on government, believe they are victims entitled to government handouts, & pay no income tax - that they are not getting anywhere. Republicans have to positively reach these people to improve their lives with free market policies they undertake. We have to face that something different happened in November 2008 & it was confirmed in 2012 – & that something is evil & a deliberate deception to overrun our country. The last six years has not been about the usual sort of things the two parties argue over & take turns winning elections over. These years have been about robbing liberty from people by increasing dependency on government & promoting destructive class warfare & envy & there was no end in sight to this nightmare until last Tuesday & no foreseeable practical solution other than for those of us who still believe in America to teach & live the libertarian principles that our country was founded upon. Start with the thought of freedom & explain that all prosperity comes from unleashing the free human intellect. If we lose with that message all is lost anyway @ least until John Galt comes forth. Boils down to what the Republicans do the next few months. If they grow a pair (seriously doubtful that they will) they may have a chance at rebuilding their party. The fear is that Boehner, McConnell and the gang actually believe that they are the reason for the GOP's victory. That they don't realize the reason for the victory is the public's disgust with Obama and his policies. We will find out shortly if they are serious and have learned from the past. Boehner stated they will hold a vote on defunding Obama Care. Which means the media and the Democrats will challenge them with the question: "What plan do they have to replace it (Obama Care) with? c) go back to the old "system"
the Republicans will be doomed and we will know they have learned nothing. Their response should be concise, swift and to the point namely, everyone gets to open a health savings account, self funded or through their employer. They will have the opportunity to purchase a "catastrophic" in the open market from any insurance company they desire in the United States. Any other medical expenses may be paid from their HSA to their Health Care Professional. By taking the offensive and showing how this type of plan will bring down health care costs they can win the public relations battle. Whether they have the brains and the courage to do it is another matter. PS: I don't think the last 6 years have been any different than the past. It just has been a speeding up of politicians buying votes and influence. It has been building in the nation for the last 80 years and the other side believes they have enough momentum and votes to be more open about it. Remember buying votes always leads to more power for politicians. I don't buy that older Democrat leaders such as LBJ, Jimmy Carter Tom Foley and George Mitchell etc were any different than the current crop. They simply lead the way to soften up the public. Buying votes is no different than the drug pusher hooking their prey. Doug - kudos to your excellent and deep post analysis of the midterm elections. I especially am motivated with your conclusion that "all prosperity comes from unleashing the free human intellect". This is an argument we must and can win. Let us remind our friends and relatives of the numerous historical examples where free markets and individual ingenuity created new industries, jobs and improved our way of life. Contrast that with failed experiments with Communism, socialism and even European welfare states. Let us also start this argument at the grass roots level. Thanksgiving day will provide a great opportunity for this with friends and relatives. I have an idea. Since the Republicans have been unable to persuade the voters who typically vote Democrat, why don't they read this blog, the WSJ, or listen to Larry Kudlow for ideas to present free market capitalism persuasively. How would BO, Reid, Pelosi answer your question of what economic freedom principles are enhanced by raising taxes. Yeah, BO would say it is a matter of fairness, well fairness to a guy who has been unemployed for 6 months or more would be better served by keeping the money in the hands of a person who wants to take a chance that his idea and his energy will create wealth, not just for him but as a business grows for those he hires.